Twenty feet tall, made of concrete. Lately converted into a champagne bottle. East edge of town on the north side of US Hwy 30/White Horse Pike, just east of Bremen Ave. This is cool if you happen to be driving by, but don't go too far off your path to see it. The story I've heard about the wine bottles is that some of them are on land not owned by the winery and there have been disputes over payment of rent/lease for the advertising space. Near the wine bottle at the corner of Rt. 30 and Bremen Ave. is a house surrounded by a billboard that used to advertise the winery to westbound travelers on Rt. 30. About two years ago, it was boarded over. Around the same time, a billboard appeared on the eastbound side. That intersection is unusually prone to accidents, usually around 3:30 in the afternoon. I want to put a camera on top of the warehouse to see how the accidents keep happening. I usually just hear the "boom" and run outside with a fire extinguisher. 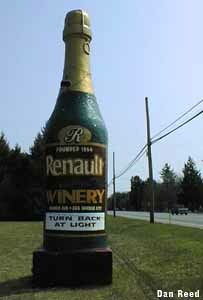 The Renault winery "bottles" along RT 30, Egg Harbor NJ. Been around since the 20s. This one was hit by a truck a few years back, but has been recently fixed and repainted! Yay! Junk Sculptures: Peterson's Garage, Egg Harbor City, NJ - 1 mi. Storybook Land, Egg Harbor Township, NJ - 7 mi. Hubcap Pyramid, Mays Landing, NJ - 8 mi. Water Tank Robots, Vincentown, NJ - 24 mi.